HomeAir PurifierWhy Does your Car Cabin Smell Bad When Parked in the Sun? Why Does your Car Cabin Smell Bad When Parked in the Sun? Does your car smell of gases, especially when its closed for a long period of time or parked in the sun? Though the car cabin heating up is a common problem, the smelly part is something that you need to be concerned. Foul and pungent smell in the car indicates that there is something wrong and you need to take the right steps to overcome the problem. Using a car cabin freshener is only a temporary solution to the problem. The blog lists 5 reasons why your car cabin smells bad when parked in the sun. The presence of dust particles in the car cabin can lead to allergies and a number of respiratory issues. This is the reason why your car comes with a basic air filter which restricts dust particles from entering the car cabin. However, the air filter degrades over the time as a result of absorbing too much dust. The presence of odor inducing elements in the air filter releases pungent smells in the car cabin. If you get a damp smell on switching on the air conditioner, it indicates mold or mildew growth in the air conditioner. The evaporator of the air conditioning system of your vehicle collects moisture, which makes it an ideal place for mold growth. During summer, the air conditioning system also absorbs sweat from your body, which also contributes to mold growth. If your car smells of a gas leak, especially when its running or during summer, there is some serious issue with the vehicle. Though some amount of smell is not a big deal, a strong smell indicates there is a gas leak. In fact, fuel injected cars should never have a strong smell of gas. Faulty fuel lines, bad fuel pressure regulators, stuck injectors are some of the reasons for a gas leak in the car. This is a common type of smell that most of the car owners are familiar with, especially in the summer. When you park the car in sun, the car’s interior made of plastic or rubber heats up, resulting in the uncomfortable smell. However, most of the car owners are not aware of the harmful effect of the smell on their health. Formaldehyde, which is commonly present in the interiors, forms a carcinogen when the car heats up. So, how to get rid of bad smell in the car? An easy and effective way to get rid of foul smells is by using a car air purifier. During summer, the car cabin heats up and releases a lot of gases which is harmful to your health. The HEPA car air purifier from KENT comes with three stage HEPA filtration that removes hazardous pollutants from the car cabin. HEPA filter removes 99% of the pollutants from the car cabin so that you breathe safely. 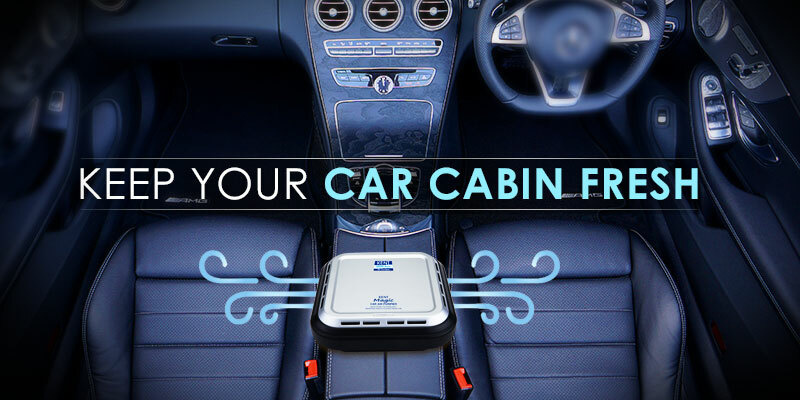 The car air purifier also comes with carbon filter which effectively removes odor from the car cabin to make it fresh. Visit our website to find out more about KENT Magic car air purifiers.